Silicon (Si) is the second most abundant element in the Earth's crust and is an important nutrient in the ocean. The global Si cycle plays a critical role in regulating primary productivity and carbon cycling on the continents and in the oceans. Development of the analytical tools used to study the sources, sinks, and fluxes of the global Si cycle (e.g., elemental and stable isotope ratio data for Ge, Si, Zn, etc.) have recently led to major advances in our understanding of the mechanisms and processes that constrain the cycling of Si in the modern environment and in the past. Here, we provide background on the geochemical tools that are available for studying the Si cycle and highlight our current understanding of the marine, freshwater and terrestrial systems. We place emphasis on the geochemistry (e.g., Al/Si, Ge/Si, Zn/Si, δ13C, δ15N, δ18O, δ30Si) of dissolved and biogenic Si, present case studies, such as the Silicic Acid Leakage Hypothesis, and discuss challenges associated with the development of these environmental proxies for the global Si cycle. We also discuss how each system within the global Si cycle might change over time (i.e., sources, sinks, and processes) and the potential technical and conceptual limitations that need to be considered for future studies. The global silicon (Si) cycle is of great interest due to the role that silicate weathering has played in maintaining climatic stability on geological time scales (Siever, 1991; Frings et al., 2016; Conley et al., 2017) and because Si is an important nutrient for many organisms in marine and freshwater ecosystems. It occurs as silicate minerals in association with all rock types (igneous, metamorphic, sedimentary). Weathering, biological and geochemical transformations, transport and interactions with other elements (in particular nutrients and carbon) form the basis of the global biogeochemical Si cycle (Frings et al., 2016). The global Si cycle has evolved through geologic time with overall declines in oceanic dissolved Si due to the uptake and deposition by organisms (Siever, 1991; Conley et al., 2017). While the modern Si biogeochemical cycle is influenced by anthropogenic forcing (Laruelle et al., 2009), the processes of weathering and burial as biogenic silica (bSiO2) are the dominant processes in the biogeochemical Si cycle. (1) What is the bio-geochemistry of biogenic silica? (2) What is the current state of knowledge regarding the influence of biogenic silica on the global Si cycle? (3) What is the influence of early to late sediment diagenesis on biogenic silica, and thus its utility as an environmental proxy for palaeoceanographic interpretation? Although modeling is not being covered in the review, its importance cannot be underscored as it has been increasingly used to understand the mechanisms controlling Si isotope fractionation (e.g., Qin et al., 2016) and the development of the Si isotope composition as a tracer of biogeochemical silicon cycle in modern and past natural systems (e.g., Gao et al., 2016). The chemical weathering of silicate minerals and the eventual cycling of weathered products (clays, dissolved Si) provide the starting point of Si bio-geochemistry and its interaction with other elemental cycles such as carbon. Silicate weathering represents an important sink of atmospheric CO2 over geological time scales (Berner et al., 1983; Wollast and Mackenzie, 1989; Brady and Carroll, 1994) and depends on temperature and precipitation. Thus, the rate at which weathering occurs will be enhanced through changes in global temperature (White and Blum, 1995). Silicon rarely occurs as the pure element in nature and appears most often in combination with oxygen to form solid silicate minerals or amorphous compounds (including biogenic Si), or in aqueous solutions it occurs as orthosilicic acid (Si(OH)4) (Iler, 1979). Silicon exists in major pools in dissolved and solid forms in all reservoirs: extra-terrestrial, continental (e.g., soil, vegetation, hydrothermal), freshwater (e.g., rivers, lakes, groundwater, organisms, sediment), atmospheric (e.g., aerosols), and oceanic (e.g., water column, organisms, sediment and pore-waters, oceanic crust, hydrothermal), (Figure 1). The dominant transformation processes are weathering of silicate rocks and the formation of secondary minerals and release of dissolved Si, uptake of dissolved Si by organisms for the biomineralization of biogenic Si, and the remineralization of Si. Coastal regions are of special importance here because they support a large fraction of the global primary production and control the transfer of dissolved and particulate nutrients from land to the open ocean (Conley et al., 1993; Rabouille et al., 2001). Figure 1. Schematic of the modern day global Si cycle grouped by reservoir and their associated δ30Si values (in ‰). The figure is divided into three parts. The upper part indicating the magnitude of the fluxes (in 1012mol yr−1; Tmol yr−1) between each reservoir, the middle part showing their associated δ30Si values, and the lower part showing reservoir size. The fluxes are numerically and figuratively represented, moving in a clockwise manner (e.g., In the Ocean compartment, there is a flux of 240 Tmol yr−1 from Surface DSi to Diatoms, after the Diatoms dissolve, there is 135 Tmol yr−1 flux back from the Diatoms to the Surface DSi in the upper water column). In the case where the flux points downwards (e.g., 9.90 Tmol yr−1 within the sediment reservoir), the flux is effectively removed from the system. * Value assumed to underestimate flux (see section Diagenetic Silica Precipitation and Reverse Weathering). Estimates for the Si fluxes were obtained from the following sources: Carey and Fulweiler (2012), Frings et al. (2016), Laruelle et al. (2009), Tréguer and De La Rocha (2013). Estimates for the range of δ30Si values were obtained from the following sources: Ehlert et al. (2016); Figure 2 from Frings et al. (2016) and references therein; Varela et al. (2016) and Panizzo et al. (2017). All data used to prepare this figure are available in Table S1. Many organisms use dissolved Si, including diatoms, silicoflagellates, radiolarians, sponges, and higher plants, to produce solid bSiO2 structures. Biogenic silica, also called biogenic opal, is the second most abundant mineral type formed by organisms after calcium carbonate (Brümmer, 2003). Biogenic silica is amorphous and its density, hardness, solubility, viscosity and composition may vary considerably (Perry et al., 2003). The silica structures are based upon a random network of SiO4 tetrahedral units connected through covalently linked Si-O-Si bonds of variable bond angle and bond lengths (Mann and Perry, 1986). All silicifying organisms utilize Si(OH)4; however, each silicifying organism has a unique biomineralizing pathway. Details on the process of silicification can be found in the literature for diatoms (Hildebrand et al., 1997; Martin-Jezequel et al., 2000; Claquin et al., 2002; Hildebrand, 2008; Thamatrakoln and Hildebrand, 2008; Brunner et al., 2009; Thamatrakoln and Kustka, 2009), sponges (Wilkinson and Garrone, 1980; Reincke and Barthel, 1997; Cha et al., 1999; Maldonado et al., 1999, 2005; Brümmer, 2003; Uriz et al., 2003; Muller et al., 2007; Schröder et al., 2007), and higher plants (Takahashi et al., 1990; Ma et al., 2001, 2006). Globally, diatoms (unicellular autotrophic algae) dominate the bSiO2 production with an estimate of 240 ± 40 Tmol yr−1 (Tréguer and De La Rocha, 2013) (Figure 1). The degree of bSiO2 production (i.e., silicification) of diatom frustules can vary significantly, even within the same species, and is primarily a function of ambient dissolved Si (DSi) concentration and cellular growth rate, whereby the bSiO2 content of a cell decreases during DSi limitation and/or accelerated growth (Martin-Jezequel et al., 2000; Claquin et al., 2002; Baines et al., 2010). Until recently, the relevance of marine siliceous sponges on the Si cycle has been largely ignored and their role is currently being re-visited with a biogenic Si production estimated at 3.6 ± 3.7 Tmol yr−1 (Maldonado et al., 2005; Tréguer and De La Rocha, 2013) (Figure 1). Higher plants produce roughly 84 (60–180) Tmol yr−1 of biogenic Si (phytoliths) (Figure 1), which is within a similar order of magnitude as diatom production (Conley, 2002). All plants that grow on soil contain Si in their tissues, whereby Si uptake and concentrations vary greatly among species depending on the different capacities for Si uptake by the roots (Takahashi et al., 1990; Ma et al., 2001). Active Si uptake has been suggested for Si-accumulating plants that are characterized by high Si concentrations (>1% dry weight in the leaves) and a molar Si:Ca ratio >1, whereas non-accumulating plants have a passive or discriminating Si uptake system (Takahashi et al., 1990; Ma et al., 2001). After uptake, DSi is rapidly transported through the plant to the different tissues within the transpiration stream. Due to transpirational water loss, DSi is gradually concentrated, and phytoliths are formed by precipitation in plant cells when the concentration increases above 2 mM. Thus, phytoliths vary in size and shape depending on the cell type, plant organ and plant species they are deposited in Madella et al. (2005). The global oceanic Si cycle has evolved through geologic time primarily due to the uptake of dissolved Si and subsequent biomineralization by organisms, especially sponges, radiolarians and diatoms (Siever, 1991). Substantial advances have occurred in our understanding of the evolution of the geological Si cycle through the use of the fossil record, silica isotope geochemistry and the phylogenomics of biosilicification (Conley et al., 2017; Hendry et al., 2018). The first biological impacts on the Si cycle are hypothesized to have occurred with the evolution of cyanobacteria in the Archean with further decreases in the mid-Proterozoic with evolution of eukaryotes capable of Si biomineralization. Decreases in oceanic DSi occurred prior to the start of the Phanerozoic with the evolution of widespread, large-scale skeletal bio-silicification. Due to the increased usage of dissolved Si by radiolarians in the lower to early Middle Ordovician, the loci of sponges shifted from shallow to deep-water basinal environments (Kidder and Tomescu, 2016). Finally, it is the appearance and subsequent proliferation of diatoms, with their superior ability to utilize low concentrations of DSi, that decreased DSi to the low levels observed in the global oceans today (Tréguer and De La Rocha, 2013). The impact of orogeny, e.g., the uplift of the Himalayas with periods of enhanced continental weathering fluxes in the Cenozoic (Misra and Froelich, 2012) could have increased DSi input to the oceans (Cermeño et al., 2015), although there is no evidence of large-scale changes in DSi concentrations in the geologic record (Fontorbe et al., 2016, 2017). In the recent years, there have been a considerable number of studies on palaeo-environments of the Archean (4 – 2.5 Ga) and Proterozoic (2.5 – 0.5 Ga). Most use Si - O isotopes, elemental ratios (Ge/Si, REEs) or other isotopic systems (Fe, S…) associated to silica in Banded Iron Formations (e.g., André et al., 2006; Heck et al., 2011; Delvigne et al., 2012), cherts (e.g., Robert and Chaussidon, 2006; Chakrabarti et al., 2012) or paleosols (e.g., Delvigne et al., 2016). These studies all use the knowledge gained from modern, experimental and/or less ancient palaeo-records to interpret geochemical records, in order to reconstruct, for instance, the ocean temperature and oxygen levels, input of hydrothermal, and intensity of weathering. However, it is still challenging to provide a clear picture of these ancient environments because the studies have divergent results. A multi-proxy approach is therefore required. This is particularly needed to assess the level of preservation of the samples in order to take into account diagenesis while interpreting the geochemical signals into reconstruction of paleo-environments (Marin-Carbonne et al., 2014). Modern day anthropogenic factors have a strong influence on the global Si cycle, for example through increases in CO2, temperature and changes in hydrological regimes and erosion, variations in agriculture and land use, eutrophication and changes in nutrient stoichiometry in coastal regions, and river damming (e.g., Rickert et al., 2002; Struyf et al., 2004, 2010; Laruelle et al., 2009; Clymans et al., 2011; Carey and Fulweiler, 2012). Anthropogenic perturbations of the global biogeochemical Si cycle are due to the gradual aggradation or depletion of the amorphous SiO2 pool held in continental soils (Barão et al., 2015; Vandevenne et al., 2015) and aquatic sediments (Frings et al., 2014b) in response to these changing environmental forcings (Struyf and Conley, 2012) and river damming (Conley et al., 1993). Our emerging understanding is that DSi inputs from the continents have potentially altered the magnitude and δ30Si composition of DSi supplied to the open ocean mostly because of changes occurring on the continent as well as changes of the silica sink on continental margins (Bernard et al., 2010; Frings et al., 2016). This includes short time scales such as anthropogenic impacts (not only on Si, but also on other nutrients e.g., N, P, Fe) and possibly to an extent large enough to impact whole-ocean isotopic signatures on the timescale of Quaternary glacial cycles. Thus, the sensitivity of biogeochemical Si cycling to anthropogenic pressure, especially in coastal regions, will likely be highlighted in the future (Laruelle et al., 2009; Bernard et al., 2010) and the continental Si cycle should not be neglected when interpreting pre-Quaternary long-term δ30SibSiO2 records from marine sediment records (Egan et al., 2013; Fontorbe et al., 2016). where n can represent 29Si or 30Si, x refers to either bSiO2 or DSi and standard is the atomic ratio of the heavy and light Si isotopes of the quartz standard (NBS28). Where k refers to the rate constants for the reaction of light and heavy isotopes. Where A and B are two chemical substances, typically the substrate (A) and the product (B) of the reaction. where αbSiO2−DSi is the isotopic fractionation factor between the product (bSiO2) and the substrate (DSi). Note the lack of redox speciation and organic complexation for silicon limits fractionation effects to predominately inorganic kinetic exchange factors, contrary to many other elements (Wiederhold, 2015). The following is a description of the systems, processes and transformations that control the global silica cycle, and the known constraints on the δ30Si (see Figure 1). Weathering is a major process that fractionates Si isotopes in the critical zone. When primary minerals (−0.90 < δ30Si < +1.40‰, Figure 1) are weathered, light Si isotopes are preferentially incorporated into secondary minerals (−2.95 < δ30Si < +2.5‰) releasing a DSi pool that generally has an enriched isotope composition (−1 < δ30Si < +2‰) (cf. reviews of Opfergelt and Delmelle, 2012; Frings et al., 2016), Figure 1, Supplementary Table 1 and references therein). Adsorption of silicic acid onto Fe oxy-hydroxides (Delstanche et al., 2009) and Al hydroxides (Oelze et al., 2014) has also been demonstrated to preferentially immobilize the lighter Si isotopes. As discussed in section Rivers, all these processes are particularly complex on seasonal to geological timescales (Ziegler et al., 2005) and explain most of the higher δ30SiDSi of continental waters. Significant fractionation has been observed during the uptake of Si by plant roots (Opfergelt et al., 2006a,b; Ding et al., 2008a,b; Sun et al., 2008) and exogenous material on the surface of vegetation (Engström et al., 2008), although the transporters behind both forms of uptake remain largely unknown. The δ30Si composition of these plants (Figure 1), and in particular of phytoliths is in the first instance regulated by the physical environment around the plant including the soluble Si concentration of the medium (Opfergelt et al., 2006b), the weathering of the soil substrate (Opfergelt et al., 2008) and soil organic matter (Ding et al., 2008a). Beyond this, there is clear evidence that significant isotopic fractionation can occur between plants with increased fractionation in heavy Si accumulators (Ding et al., 2005, 2008a,b; Opfergelt et al., 2006a,b). Rayleigh fractionation during the transportation of Si within plants also causes heavier isotopes to be concentrated within the xylem whilst lighter isotopes are preferentially deposited in phytoliths lower down the plant (Ding et al., 2005, 2008a,b; Opfergelt et al., 2006a,b; Hodson et al., 2008). Phytoliths have higher dissolution rates than other silicate materials (e.g., tephra, clay, feldspars, quartz), and provide a major source of DSi in some soil/terrestrial environments (Derry et al., 2005; Struyf et al., 2009; Cornelis et al., 2010; Opfergelt et al., 2010). Over the past two decades, several studies of δ30Si in DSi in freshwaters have been published, but we are still only beginning to understand the controls and variability of δ30Si in freshwaters. Since the first data of DSi in freshwaters by De La Rocha (De La Rocha et al., 2000), δ30Si has been analyzed from a number of rivers (and lakes) across the world including the Congo River and tributaries (Cardinal et al., 2010; Hughes et al., 2011), the Tana River (Hughes et al., 2012), the Yellow and Yangtze Rivers (Ding et al., 2004, 2011), the Kalix River in Sweden (Engström et al., 2010), Swiss alpine rivers (Georg et al., 2006), and most recently from the Nile River (Cockerton et al., 2013), the Amazon river and tributaries (Hughes et al., 2013), areas of central Siberia (Pokrovsky et al., 2013; Panizzo et al., 2017) and the Ganges (Fontorbe et al., 2013; Frings et al., 2015). The range in δ30Si from freshwaters, thus far analyzed, now stands at −0.17 to +4.66‰ (Figure 1). In big-picture terms, (almost) every measurement ever made of river water DSi has been heavier than the parent material. When river water DSi concentrations are normalized to a conservative element (typically Na, which is common in silicate rocks), then it becomes clear that Si is removed from solution, either into secondary clay minerals or some form of bSiO2, and that this removal is associated with a discrimination against the heavier isotopes of Si. This is consistent with our understanding derived from the microscale (e.g., Steinhoefel et al., 2011; Schuessler and von Blanckenburg, 2014) to the soil-column scale (e.g., Opfergelt et al., 2012; Pogge von Strandmann et al., 2012). These all show that the new secondary mineral phases have less of the heavier isotopes relative to river waters. The same discrimination is also well established for plants (Ding et al., 2005, 2008a; Opfergelt et al., 2006a,b), freshwater diatoms (Alleman et al., 2005; Panizzo et al., 2016) and sponges, which preferentially utilize 28Si over 30Si (and 29Si), thus leading to an increase in δ30Si in the host water. Broadly, δ30Si values in river waters reflect the weathering regime, which is ultimately a mass-balance constraint. We can conceptualize two end-member weathering regimes: “kinetically limited” and “supply limited” (almost equivalent to the geomorphological terms “transport limited” and “weathering limited”; see e.g., Stallard and Edmond, 1983). Kinetic limitation refers to a situation where the weathering flux (solute, DSi) is operating at maximum capacity for the conditions; increasing the factors that control the weathering rate (essentially temperature or water supply) will increase the rate of DSi export, because there is an excess of fresh material to be weathered. This could be e.g., the high Himalaya, the Andes, or (sub) glacial catchments (Georg et al., 2007; Fontorbe et al., 2013; Opfergelt et al., 2013) where physical erosion greatly outpaces chemical weathering. At very high erosion rates (low weathering intensity or congruency) river δ30Si is low: there is no time, and no thermodynamic driving force, for clays to form, soils to develop or biology to have a meaningful influence on the δ30Si measured in a stream. The other end-member (supply limited) is where essentially all material leaves the catchment as a dissolved flux; the rate of solute generation is limited by how quickly material is supplied. Increasing the factors that control the weathering rate (temperature or water supply) will not increase Si export, because there is nothing left to be weathered. In this case the conversion of parent material (bedrock) to river solute is (near-) complete, then there can be no observable fractionation: the river takes on the composition of the bedrock, regardless of how much bSiO2 cycling is taking place in the catchment (and assuming steady-state, and no loss of bSiO2). This is the case in e.g., the lowland, blackwater tributaries of the Amazon (Hughes et al., 2013) and the Congo (Cardinal et al., 2010), where the interpretation is that the swampy, organic-matter-rich environments are conducive to the dissolution of previously formed clays. Along a gradient of weathering intensity (0 to 1, where 0 is all material exported by physical erosion, and 1 where all denudation occurs as dissolved fluxes), the offset between source material (bedrock) and river δ30Si should be zero at both ends and peak somewhere in the middle (Bouchez et al., 2013). The same is true for Li isotopes (Henchiri et al., 2016); in general, the isotopic separation along a weathering regime gradient is much clearer for Li (δ7Li) than δ30Si (see e.g., Dellinger et al., 2015; Frings et al., 2016). Superimposed on the above is the role of vegetation (see section Vegetation). All the work published on the major catchment/riverine systems (e.g., Cockerton et al., 2013) highlight the complexity of lake/drainage basin systems, and clearly illustrate that both Si concentrations and δ30Si are closely controlled by a mixture of weathering/erosion processes [regulated by the wider climate system (De La Rocha et al., 2000; Opfergelt and Delmelle, 2012)], aquatic productivity and catchment soil, vegetation. Studies of the Congo Basin, for example, have shown that δ30SiDSi is mainly regulated by the intensity of silicate weathering/secondary mineral formation across the drainage basin with spatial variations further driven by the type of weathering regime and the extent to which clays are dissolved by organic matter (Cardinal et al., 2010). These abiotic processes are then superimposed by seasonal biological processes, in particular by diatom biomineralization in the dry season, which exports significant amounts of Si out of the water column (Hughes et al., 2011). Other examples also account for the downstream increase in Nile River δ30Si to the progressive uptake of DSi by diatoms and other Si-accumulating organisms (Cockerton et al., 2013). Indeed, Cockerton et al. (2013) showed significant seasonal variations in δ30Si from freshwaters, with higher δ30Si in the dry season (+1.54 to +4.66‰) than the wet season (+0.48 to +3.45‰) due to reduced mobilization of dissolved Si from the catchment relative to its aquatic demand. These examples demonstrate the superimposed (often seasonal) control that freshwater bSiO2 plays in regulating δ30Si signatures, where abiotic processes (chemical weathering and secondary mineral formation) otherwise dominate. Additional examples also show the potential importance of vegetation in altering the Si concentration and/or δ30Si and regulating the flux of Si both into/out of river waters (Alleman et al., 2005; Ding et al., 2011; Hughes et al., 2011; Cockerton et al., 2013; Pokrovsky et al., 2013). For example, along the Yangtze River uptake of DSi by grasses in wetlands and rice in paddy fields drives a progressive increase in δ30SiDSi due to better phytolith preservation in areas of high phytolith production and/or low phytolith dissolution (Ding et al., 2004). In contrast the net impact of vegetation on δ30SiDSi seems to be minimal in the Okavango Delta, Congo and Amazon Basin due to the rapid dissolution/recycling of phytoliths (Cardinal et al., 2010; Hughes et al., 2013; Frings et al., 2014b). Work on smaller aquatic systems has also shown significant temporal variations in δ30SiDSi. In a boreal river in North Sweden seasonal changes in δ30SiDSi of 0.8‰ were attributed to: (1) the release of plant derived bSiO2/phytoliths (low δ30Si) during snow melt; (2) changing inputs from headwaters; and (3) diatom biomineralization (Engström et al., 2010). Similarly, seasonal changes in δ30SiDSi of up to 0.6‰ were observed in a series of rivers in Switzerland (Georg et al., 2006), whilst variations in a series of Icelandic rivers have been linked to differential erosion rates and secondary minerals formation (Opfergelt et al., 2013). Other studies have shown a significant anthropogenic impact on δ30SiDSi, often in response to land use changes and dam construction (Sun et al., 2011; Hughes et al., 2012; Delvaux et al., 2013). As a case study, along the River Nile, intensive water management through the irrigation/retention of waters behind dams exerts a significant control on δ30SiDSi (Cockerton et al., 2013). In the Tana River (Kenya), downstream increases (decreases) in δ30SiDSi (DSi) are attributed to both greater water retention time and the higher diatom DSi utilization in dams and reservoirs (Hughes et al., 2012), which leads to heavier (+0.54‰) downstream DSi compositions and a 41% decrease in concentrations. Similarly, outside of diatom growth season periods, the δ30SiDSi signature of Scheldt River (Belgium) tributaries (a human disturbed watershed) are negatively correlated to the percentage of forest cover (r2 = 0.95, p-value < 0.01) and positively correlated to the percentage of arable land cover (r2 = 0.70, p-value < 0.08) in the basin, suggesting that land use is a major control here on δ30SiDSi signatures (Delvaux et al., 2013). All of these examples document how temporal (namely seasonal) and spatial changes in riverine δ30SiDSi in both small and large drainage basins, can have great impact upon the delivery of DSi and δ30SiDSi to the oceans over time (Frings et al., 2016). As outlined above, the cycling of DSi in river water is not a straightforward process. In general, we have a good conceptual understanding of the qualitative nature of the processes and the associated fractionations, but quantifying the fractionation at each step in the processes is often challenging. This is not a problem that is unique to Si isotope systematics (see Eiler et al., 2014). The key steps in the generation of river water DSi include: (1) dissolution of the primary mineral, (2) incorporation of some fraction of this as a secondary phase, (3) bio-cycling and soil-column processes. Each of these steps is associated with multiple fractionations: We are beginning to understand that the (overall) Si isotope fractionation associated with any given process is extremely variable. Note that an analogy can be made with the ongoing work on biological Si fractionation (Sutton et al., 2013; Hendry et al., 2015). This range in observable isotope fractionation occurs because each phase transformation is typically several steps, each with their own fractionation. For example, the weathering of a primary silicate mineral to a secondary clay (e.g., plagioclase to kaolinite) will potentially involve breaking of bonds in mineral surface, diffusion across a leached layer and/or thin mineral-fluid boundary layer, de-solvation/coordination into and from solution, transfer to the precipitation site, and the forming of new bonds in the new mineral. Each step can involve isotope fractionation, plus various mass-balance constraints that regulate how much this fractionation can be expressed. They also involve fractionations of two fundamentally different manners: kinetic and equilibrium, which arise from Newtonian dynamics and bond-strength effects, respectively. Importantly, these fractionation events tend to cause opposing fractionation of the Si isotopes and complicate the interpretations of the resulting δ30Si values. Laboratory experiments confirm that the combined fractionations associated with important processes (Si adsorption or precipitation) are both rate and temperature dependent (Geilert et al., 2014; Oelze et al., 2014, 2015; Roerdink et al., 2015), conclusions that are corroborated by well-designed field experiments (Geilert et al., 2015). In general, it is clear that there is no such thing as a single fractionation factor for a given process. This makes it hard to quantitatively interpret e.g., river DSi at a large scale, especially without a robust independent estimate of “fSi,” the fraction of Si remaining in solution. Catchment mass-balance models (e.g., Bouchez et al., 2013)) can help, but require that river sediment is collected and measured simultaneously and assume catchment steady-state. Predicting the magnitude, and even direction, of changes in the δ30Si values of river water during glacial-interglacial transitions is confounded by multiple parameters that are only qualitatively understood. It is not clear, for example, if these transitions would result in a congruent weathering regime. Lacustrine systems represent a key component of the continental Si cycle, although only a handful of results have been published to date (Figure 1). Whilst riverine inputs cause initial lake profiles to be primarily a function of upstream catchment processes (weathering of rock and productivity inputs), subsequent in-lake DSi biomineralization can significantly modify DSi/δ30SiDSi before waters continue through the outflow and eventually into the marine system (Alleman et al., 2005; Opfergelt et al., 2011). As with the oceans, siliceous productivity in lakes is primarily a function of light and nutrient availability. Accordingly, spatial/temporal patterns of DSi/δ30SiDSi can often be linked to factors including mixing/stratification regimes, which regulate the supply of nutrient rich deep waters to the photic zone and the retention of organisms in surface waters (Alleman et al., 2005). The net efficiency of the biological pump in transferring Si from the water column into the sediment record is often higher in lakes than marine systems, due to lower dissolution rates that are in turn influenced by faster rates of sinking and sediment accumulation. However, in instances where dissolution is significant, for example in response to elevated pH or salinity, the impacts are clearly observed with elevated DSi concentrations and lower δ30Si (Opfergelt et al., 2011). Importantly, the contemporary studies carried out to date all highlight the potential for δ30Si to be used to study temporal changes in Si cycling, for example through the use of sediment cores. Whilst several organisms (diatoms, radiolaria, sponges) have been explored for this purpose in marine environments, work on freshwater systems has so far focused on diatoms with few data for other organisms (e.g., sponges Hughes et al., 2011). Calibrations have replicated marine studies in demonstrating a fractionation factor of ca. −1.1‰ that is independent of temperature and species (Alleman et al., 2005). Furthermore, contemporary data of δ30Sidiatom from open sediment traps placed down the Lake Baikal water profile found a near constant δ30Sidiatom composition, suggesting the full preservation of the signal through the water column (Panizzo et al., 2016). More importantly, their comparison with δ30Sidiatom in surface sediments, where high diatom valve dissolution occurs, argued for the absence of a Si isotope fractionation associated with diatom dissolution (Panizzo et al., 2016). As outlined above, there have been a handful of studies to date that have examined the application of δ30SiDSi in limnological settings (Alleman et al., 2005; Opfergelt et al., 2011; Panizzo et al., 2016, 2017). Lakes, in addition to the soil-vegetation system, play an important role in buffering continental DSi export to the oceans. Previous assumptions were that this buffering capacity of the continental Si cycle was in steady-state; however, this has now been challenged (Frings et al., 2014a). Frings et al. (2014a) highlight the effectiveness of lacustrine environments in retaining DSi in sediments via the bSiO2 pump, which on a global scale can translate to a net export of between 21 and 27% of river DSi export. This equates to an estimation of 1.53 Tmol yr−1 (Frings et al., 2014a) (Figure 1). 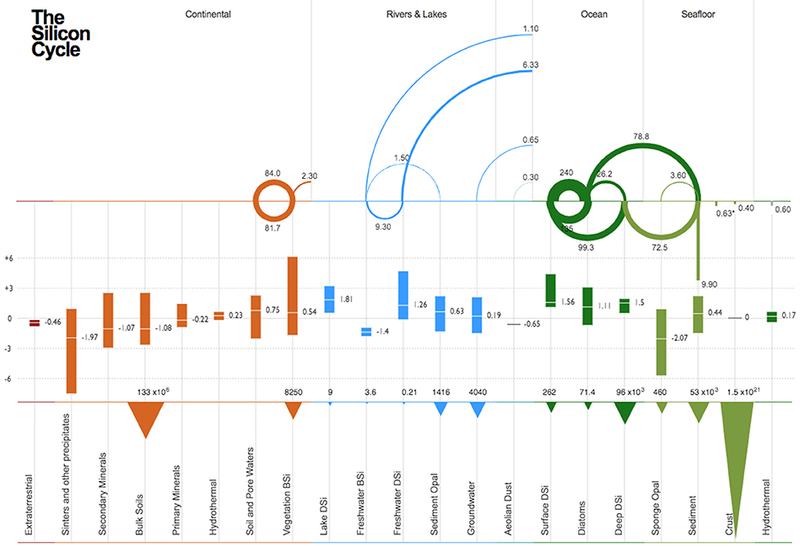 These data highlight the challenges in underpinning global estimates of lake biogeochemical cycling (particularly for large lakes and reservoirs) to better constrain the evolution of the global biogeochemical cycling of Si. Since active fractionation of δ30Si by diatoms occurs within the euphotic zone of the ocean, the most extreme δ30SiDSi values are found within the uppermost 100 m of the water column, with values reaching above +3‰ both in highly nutrient-depleted oligotrophic gyres (with DSi concentrations <1 μM; Reynolds et al., 2006; Grasse et al., 2013) as well as in the slightly more Si-rich high-latitude upwelling regions (with DSi concentrations of 2–13 μM; Varela et al., 2004; Fripiat et al., 2011; de Souza et al., 2012a). These values are amongst the most highly fractionated δ30Si values reported in the literature (Reynolds, 2011), and at any given location within the ocean, the surface ocean represents the highest δ30SiDSi value found in the water column (e.g., Cardinal et al., 2005; Cavagna et al., 2011; Ehlert et al., 2012). Below the maximum in the surface ocean, depth profiles of δ30SiDSi typically show a monotonic decrease with depth, mirroring the increase in DSi concentration. The steepness of this isotopic gradient varies with oceanographic setting, with sharp δ30SiDSi decreases observed in upwelling regions where DSi concentrations increase quickly with depth (e.g., Cardinal et al., 2005; Ehlert et al., 2012). Elsewhere in the open ocean, where the silicicline is depressed and DSi concentrations increase only slowly through the uppermost 1,000 m of the water column, δ30SiDSi values remain elevated to intermediate depths, and can reach up to +1.8‰ at depths of ~800 m (de Souza et al., 2012a). These elevated values, which result from fractionation of δ30Si within the euphotic zone, provide robust evidence that the bSiO2-poor nature of the upper ocean is due to the spreading of DSi-depleted water masses that derive from the Southern Ocean, as initially suggested by Sarmiento et al. (2004). These water masses, Sub-Antarctic Mode Water (SAMW) and Antarctic Intermediate Water (AAIW), form from high-latitude surface water masses from which DSi has been stripped by the uptake of heavily silicified Southern Ocean diatoms. This DSi depletion is associated with an isotope fractionation, imparting SAMW and AAIW a high δ30SiDSi signature (de Souza et al., 2012a), a process that has been dubbed “Southern Ocean isotope distillation” by Brzezinski and Jones (Brzezinski and Jones, 2015). The high δ30SiDSi signature of SAMW and AAIW is exported to the upper ocean at a near-global scale (De La Rocha et al., 1998; de Souza et al., 2012a,b; Brzezinski and Jones, 2015; Singh et al., 2015). The upper-ocean δ30SiDSi distribution thus reflects the importance of Southern Ocean water-mass subduction in resupplying DSi, together with other major nutrients, to the nutrient-poor low-latitude upper ocean. 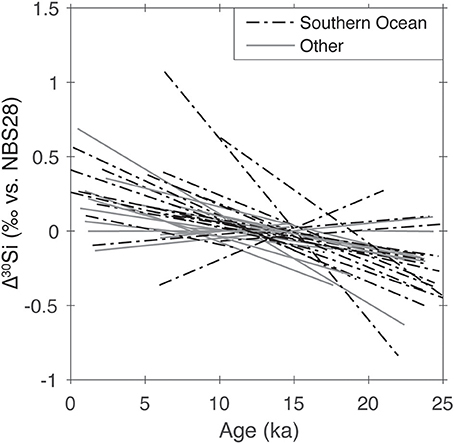 The major exception to this strong Southern Ocean influence is the DSi-rich upper ocean of the North Pacific Ocean (Reynolds et al., 2006), which obtains its DSi inventory via upwelling in the subarctic Pacific and also influences the upper-ocean δ30SiDSi distribution of the equatorial Pacific (Beucher et al., 2008, 2011; de Souza et al., 2012a). By far the most coherent large-scale δ30SiDSi variability in the global ocean is observed in the deep and abyssal ocean, below about 2,000 m. Here, DSi concentrations vary by a factor of ~20, from a little over 10 μM in the DSi-poor waters formed in the North Atlantic Ocean, to over 180 μM in the old, DSi-rich waters of the North Pacific Ocean (Garcia et al., 2014). The strongest DSi gradient is observed within the deep waters of the Atlantic Ocean, where DSi-poor North Atlantic Deep Water (NADW) overlies DSi-rich abyssal waters of Southern Ocean origin (Antarctic Bottom Water, AABW). This DSi gradient is associated with a coherent δ30SiDSi gradient between isotopically light AABW (+1.2‰) and isotopically heavy NADW with values up to +1.8‰ (de Souza et al., 2012b; Brzezinski and Jones, 2015). It has been argued that the elevated δ30SiDSi value of NADW is the result of the cross-equatorial transport of a heavy δ30SiDSi signature by SAMW and AAIW, which flow northward in the Atlantic Ocean to close the upper limb of the meridional overturning circulation (Ehlert et al., 2012; de Souza et al., 2015), illustrating the degree to which Southern Ocean Si utilization and the associated “distillation” of isotopes affects the δ30SiDSi distribution at the global scale even in the deep ocean. Indeed, this Southern Ocean influence would appear to extend as far north as the Arctic Ocean: recent work has shown that Arctic deep waters Ocean bear the most elevated δ30SiDSi values in the global ocean, with values averaging +1.9‰ (Varela et al., 2016). Since the Arctic Ocean receives most of its inflow from intermediate waters of the northern Atlantic Ocean, which are influenced by AAIW, the low-DSi, high-δ30SiDSi end-member characteristics of the deep Arctic Ocean may ultimately derive from Southern Ocean isotope “distillation,” although the role of more local processes such as Si cycling within the Arctic Ocean as well as Si input from riverine discharge need to be investigated in more detail. Apart from the Atlantic and Arctic Oceans, the deep water δ30SiDSi distribution shows markedly little variability, with Indian and Pacific Ocean deep waters exhibiting δ30SiDSi values of around +1.2‰ to +1.3‰ (Beucher et al., 2008, 2011; de Souza et al., 2012a; Grasse et al., 2013; Singh et al., 2015), i.e., essentially invariant considering the degree of analytical consistency between laboratories (Reynolds et al., 2007; Grasse et al., 2017). Although there are some hints of heterogeneity in the North Pacific, e.g., in the Cascadia Basin proximal to the North American continent (Beucher et al., 2008), when compared to the ~0.5‰ meridional gradient observed in the Atlantic Ocean, δ30SiDSi variability in the Indian and Pacific Oceans is neither particularly significant nor systematic. A possible explanation for this homogeneity comes from a modeling study of the controls on the deep ocean δ30SiDSi distribution (de Souza et al., 2014), which found that deep water δ30SiDSi values outside the Atlantic and Arctic Oceans are very strongly governed by the export of isotopically light DSi-rich abyssal water from the Southern Ocean. There are two types of hydrothermal vents that influence the marine Si cycle: (A) on-ridge hot (near critical point) black smoker fluids and, (B) warm (>45°C) and cool (<20°C) Ridge Flank Hydrothermal Fluids (RFHF). They are inherently similar in terms of the Si transfer to the ocean because (a) reactions at high and low temperature leach Si from the oceanic crust, resulting in high (17 ± 3 mmol/kg for hot) and moderate (~0.5 ± 0.2 mmol/kg for warm and cool) DSi hydrothermal fluids and (b) cooling of the hot fluids or warming of the cool and warm fluids removes DSi through precipitation of smectite-like clays before their venting from the seabed (Wheat and McManus, 2005). At a global scale, high temperature hydrothermal DSi fluxes can be constrained at a maximal of 0.14 ± 0.02 Tmol yr−1 using a Si input of 17 ± 3 mmol/kg (the average concentration in hydrothermal vents at an exit temperature of 300°C) with a water flux at 8 × 1012 kg yr−1 (Coogan and Dosso, 2012). However, the influence of hydrothermal inputs on the global marine Si cycle remain uncertain due to the paucity of δ30Si data available. To date, the only published data are two data points (−0.4‰ and −0.2‰) for hydrothermal vents on the East Pacific Rise (De La Rocha et al., 2000). Upon deposition on the seabed, recycling of SiO2 during early diagenesis in marine sediments involves: (a) initial dissolution of bSiO2 and/or detrital siliceous phases and consequent DSi build-up in marine pore waters (b) flux of dissolved Si out of the sediments and (c) bSiO2 reconstitution and/or precipitation of SiO2-rich diagenetic solid phases. The three recycling processes take place simultaneously and ultimately control DSi fluxes and diagenetic SiO2 deposition and storage in marine sediments (Dixit et al., 2001; Aller, 2014) (Figure 1). When early diagenetic siliceous precipitates are rich in seawater-derived cations (e.g., K, Mg) the precipitation process is called “reverse weathering” and the cation-rich precipitates “reverse weathering products” (Mackenzie and Garrels, 1966; Michalopoulos and Aller, 1995). The δ30Si of pore waters from marine sediments is an indicator of diagenetic turnover of Si and its impact on the preservation of environmental signals in bSiO2 (Ehlert et al., 2016). In fine-grained terrigenous sediments of the Amazon delta these authigenic Al-Si phases form at a rate as high as 280 μmol Si cm−2 yr−1 (Michalopoulos and Aller, 2004). In shelf sediments the rate is thought to be substantially lower at around 56 μmol Si cm−2 yr−1, which, however, means that approximately 24% of the total dissolving bSiO2 re-precipitates in the upper few centimeters of the sediment (Ehlert et al., 2016). Several experimental studies have shown that such Si precipitation is associated with strong enrichment of light Si isotopes up to −4.5‰ in the product although they were not focused on sediment—pore water diagenesis (e.g., Geilert et al., 2014; Oelze et al., 2014, 2015; Roerdink et al., 2015). To date, there have been only a few studies that investigated the effect of diagenesis on preservation of the primary environmental signal in bSiO2 and they found potentially differing results. Demarest et al. (2009) reported a preferential release of light Si isotopes during partial dissolution of bSiO2 in batch reactors, whereas leaching experiments with sediments showed no fractionation (Wetzel et al., 2014; Tatzel et al., 2015). In young hemi-pelagic sediments, the early diagenetic formation of new Al-Si phases is focused in the topmost layer of the sediment column (ca. 0–10 cm sediment depth). Ehlert et al. (2016) found pore waters from the Peruvian shelf with high δ30Si (average 1.46 ± 0.22‰) with the highest values occurring close to the sediment–water interface. These values were enriched compared to bSiO2 in the cores (average 0.85 ± 0.28‰) and overlying bottom water (<1.5‰), which is consistent with the formation of authigenic Al-Si phases from the dissolving bSiO2. The fractionation factor between the precipitates and the pore waters was estimated at −2.0‰. However, the isotope composition of the bSiO2 seemed to remain constant within the reactive surface layer where most of the dissolution and precipitation occurred, which makes isotopic fractionation during dissolution unlikely. From leaching experiments on older Pleistocene and Pliocene sediments, Tatzel et al. (2015) report that the formation of authigenic Al-Si phases should be 2‰ lighter than the pore waters they formed from, in agreement with previous experimental results (Delstanche et al., 2009; Geilert et al., 2014; Oelze et al., 2014, 2015). However, the authors observed an increase of the Si isotope composition of the preserved SiO2 during phase transformation from opal-A to opal-CT. The reason for this was an isotope exchange between SiO2 and pore water, and the Si isotope increase was higher with an increase in the amount of detrital material in the sediment. It has been proposed that reverse weathering reactions in marine sediments are significant oceanic sinks for K, Mg, and alkalinity (Mackenzie and Garrels, 1966; Rude and Aller, 1994; Michalopoulos and Aller, 1995, 2004; Sun et al., 2016). The precipitation process can also involve the uptake of minor elements (Li, Ge, F) into new authigenic siliceous phases, which can act as primary sinks and thus balance the oceanic mass and isotopic budget. The incorporation of redox-sensitive elements (e.g., Fe) depends on the availability and early diagenetic cycling of the relevant element in dissolved form. Currently, the flux of reverse weathering on the global Si cycle is estimated at −0.63 ± 0.6 Tmol yr−1 (Frings et al., 2016) or 1.5 ± 0.5 (Tréguer and De La Rocha, 2013) (Figure 1, Table S1), however, it is assumed that this flux is under-estimated. It has been proposed that reactive bSiO2 that has undergone reconstitution/dissolution/re-precipitation transformations remains partially unaccounted for (Michalopoulos and Aller, 2004; Presti and Michalopoulos, 2008) using the traditional operational leach method of DeMaster (1981). However, measurements of cosmogenic 32Si incorporated in reactive SiO2 products indicate that even the modified alkaline leach methods used to date in high sediment accumulation rates underestimate the amount of reconstituted bSiO2 and authigenic silicates stored in deltaic sediments (Rahman et al., 2016). Thus the conservative estimates for the net storage of altered bSiO2 and authigenic silicates in deltaic sediments range from 2–3x in the Mississippi (Presti and Michalopoulos, 2008) to 5–10x in the Amazon (Michalopoulos and Aller, 2004). Based on 32Si, actual storage in the Amazon delta may be 2–3x greater (i.e., 3–4.5 Tmol yr−1) than the best recent conservative estimates (Rahman et al., 2016). In general, the impact of dissolution, diagenesis and reverse weathering on the stable isotope analysis of bSiO2 are poorly understood. Whilst it is possible to assess the degree of recrystallization of bSiO2 through geological time (De La Rocha, 2003), there are some early stage dissolution and diagenetic processes that can occur in the water column and shallow sediments that may be more challenging to detect. However, studies seem to indicate that with high bSiO2 concentrations in the sediments, the original δ30Si of the bSiO2 is more likely to be preserved because exchange with pore water and the formation of authigenic Al-Si phases is limited. In addition to environmental alteration (see sections Pore Water and Biogenic Silica Preservation and Diagenetic Silica Precipitation and Reverse Weathering) and any analytical challenges associated with the separation and cleaning (see section Multi-proxy Geochemical Approaches in Palaeoceanography) of bSiO2 from sediment cores, ensuring the effective removal of any contaminant phases (Morley et al., 2004; Egan et al., 2012), there are a number of different biological and ecological assumptions that are required for the interpretation of both Si and oxygen isotopes (δ18O) in diatom bSiO2. Firstly, many downcore studies assume a constant δ30Si fractionation factor of −1.1 ± 0.4‰, which was based on the initial culture studies carried out by De La Rocha et al. (1997). However, more recent studies show that this fractionation factor may be more variable, and potentially species-specific, based on both field studies (e.g., Varela et al., 2004; Beucher et al., 2007; Ehlert et al., 2012; Fripiat et al., 2012) and culture experiments (Sutton et al., 2013). Secondly, the mathematical models of DSi utilization also assume a starting value of δ30SiDSi for the upwelling water, which supplies the essential nutrients to diatoms in the surface layer. To a certain extent, this can be estimated using simple box models (e.g., Beucher et al., 2007), and/or deep-water archives [see section Palaeoceanographic (and Palaeolimnological) Applications below Horn et al., 2011; Egan et al., 2013]. There is a potential that changes in water mass circulation, or end-member composition, could impact the distribution of silicon isotope ratios in the oceans (Hendry and Robinson, 2012) (see section Global Water Column Distribution). Furthermore, changes in inputs and—potentially—biological productivity and diatom bSiO2 burial could change the whole ocean Si isotope budget over periods of time longer than the residence time of Si in the ocean, 10–15 thousand years (Frings et al., 2016; Hawkings et al., 2017). The stable isotopic composition of biogenic bSiO2, together with the concentration and stable isotope composition of trace elements within the bSiO2, provide a useful source of palaeoceanographic data. The remains of silicifiers, isolated from marine sediments, are effective archives of marine Si cycling at different depths within the water column, yielding key information about DSi supply and utilization by marine algae. Si cycling by algae is important to quantify if we are to understand the processes that are critical to the cycling of carbon in the Earth's climate system, such as changes in organic carbon production and export, oceanic circulation and chemical weathering (Frings et al., 2016). Biogenic SiO2 has the potential to provide records of marine Si cycling throughout the Cenozoic in the case of diatoms, and further back into the Meso- and Palaeozoic in the case of radiolarians and sponges, as it is well-preserved and widespread in sediments, and can be readily assessed for diagenesis through XRD analysis (e.g., De La Rocha, 2003). In addition, bSiO2 archives are useful in climatically important locations where the more traditional, carbonate-based palaeoceanographic archives (principally foraminifera) are poorly preserved, such as the Quaternary Southern Ocean. In the following sections, we will provide a summary of the bSiO2-based palaeoceanographic tools available, including trace element geochemistry (section Trace Element Geochemistry of Diatoms and Sponges) and major element stable isotope methods (section Major Element Stable Isotope Ratios in Diatoms, Sponges and Radiolarians). These sections emphasize the value of multi-archive and –proxy approaches to better constrain changes in silicon (bio)geochemistry and examples of such applications are provided within the context of palaeoceanography in section Multi-proxy Geochemical Approaches in Palaeoceanography (e.g., Silicic Acid Leakage Hypothesis). Although we will focus on the more widely studied silicifying organisms (diatoms, sponges and radiolarians), there is a wealth of other silicifying organisms in the oceans that are yet to be explored for their potential as oceanographic archives. Biogenic silica incorporates low quantities of trace elements into the structure. Although often in parts per million—or less—the concentrations of these elements (often normalized to Si) can reveal information about the environmental conditions during growth. Many of these elements show strong correlations with DSi in seawater and exhibit “refractory nutrient-like” profiles. Aluminum is one of the most abundant, but highly variable, trace elements in bSiO2 ranging from 0.0001 to 0.1 g/g (e.g., Hendry et al., 2011). Although Al uptake occurs by adsorption and is present in associated clay phases (van Bennekom and van der Gaast, 1976; Moran and Moore, 1988), Al is also incorporated into living diatom bSiO2 that is still protected by an organic matrix (Gehlen et al., 2002). X-ray absorption spectra at the Al-K edge show that Al occurs in 4-fold co-ordination, with tetrahedra inserted inside the bSiO2 framework, although samples of diatom bSiO2 taken from natural marine waters show both 4- and 6-fold co-ordination, possibly as a result of clay contamination (Gehlen et al., 2002). Whilst there appear to be some climatic signals in Al/Si in diatom bSiO2 (e.g., Hendry et al., 2011), Al/Si appears to be highly susceptible to rapid alteration during early sedimentation processes, most likely sourced from clay material (Ren et al., 2013) increasing an order of magnitude or more between water column or sediment trap samples and sediment core tops in both laboratory and field studies (Koning et al., 2002, 2007; Loucaides et al., 2010; Hendry et al., 2011). In addition to Al concentration analysis, diatom bSiO2 26Al and 10Be have also been explored as archives of marine cosmogenic nuclide concentrations (Lal et al., 2006). Less is known about the Al content of other silicifiers, although limited data indicate that the Al/Si of fresh sponge bSiO2 is lower than that of diatoms (<0.0002 g/g; Hendry and Andersen, 2013). In the ocean, dissolved inorganic germanium (Ge) cycles in a manner similar to that of DSi, with Ge uptake and regeneration from diatom frustules being the main control on its oceanic distribution (Froelich and Andreae, 1981; Froelich et al., 1989; Mortlock and Froelich, 1996; Sutton et al., 2010). Although Ge mimics Si, differences in their geochemical behavior can occur reflecting differences in the oceanic inputs and losses and subtle differences in the biogeochemical cycling of these two elements within the ocean. Because of differences in molecular weight and subtle differences in chemistries, the uptake, incorporation and regeneration of Ge from diatom bSiO2 is also non-ideal. These differences are especially apparent at low DSi and Ge concentrations where there is apparent discrimination of Ge during Si uptake via bSiO2 formation (Sutton et al., 2010), which lead to significant non-zero Ge intercept and slightly non-linear behavior of the global Ge-Si relationship ([Ge] = 0.76±0.00[Si] + 0.08±0.17, r2 = 1.00, n = 248, Ge in pmol L−1 and Si in μmol L−1). The fractionation of Ge during uptake with Si is readily apparent in deep sea sponges which have a lower affinity for Si uptake (Froelich and Barthel, 1997; Reincke and Barthel, 1997; Maher et al., 2006). The two main sources of Ge and Si to the ocean are mineral weathering and hydrothermal fluids (Mortlock and Froelich, 1987; Mortlock et al., 1993; Kurtz et al., 2002). Weathering produces low Ge:Si ratios (Ge/Si) input ratios as reflected in the Ge/Si for rivers (0.3–1.2 μmol/mol), while hydrothermal fluids have higher Ge/Si input ratios (8–14 μmol/mol) (Mortlock and Froelich, 1987; Mortlock et al., 1993; Kurtz et al., 2002). The two main sinks for Ge removal from the ocean are through incorporation into bSiO2 and Ge lost via in non-opal phases (Murnane et al., 1989; Hammond et al., 2000, 2004; King et al., 2000; McManus et al., 2003). Currently, there is debate about the magnitude and loss via the ‘missing Ge sink’ (Hammond et al., 2000, 2004; King et al., 2000; McManus et al., 2003; Baronas et al., 2016; Rouxel and Luais, 2017). Recently Baronas et al. (2016) have suggested that Ge loss from the ocean appears to be dependent on pore-water oxidation–reduction reactions and the formation authigenic aluminosilicate (see section Sedimentary Processes) minerals within marine sediments. Note, a recent study looking at the links between Ge isotopes and silicon in Hawaiian hydrothermal vents has shown the potential of this new isotopic system to trace the fate of hydrothermal elements released into the ocean (Escoube et al., 2015). While inorganic Ge can be lost from solution through incorporation into biogenic silica and association with authigenic mineral formation, there is a large unreactive organic Ge pool within the dissolved phase; monomethyl- and dimethyl-germanium. The formation of these two species is relatively unknown, but it is speculated to be continentally derived and lost under anoxic conditions (Lewis et al., 1985, 1988, 1989). The residence time for these methylated forms of Ge are on the order of 100,000+ years, which is considerably longer than that of inorganic Ge. In addition, inorganic Ge can form stable complexes with organic molecules (e.g., humic acids) containing di- and polyfunctional carboxylic acids, polyalcohols and ortho-diphenols functional groups. Complexation of Ge by humic acids in freshwater regimes needs to be considered with interpreting variations in the Ge/Si ratio for the global ocean through time with respect to terrestrial inputs (Pokrovski and Schott, 1998). The organic Ge complexation has also been suggested to explain the low Ge/Si ratio in phytoliths due to different pathways of Ge relative to Si in the plant: Ge is not discriminated against at the root–soil solution interface but it is organically trapped in roots, in contrast to Si (Delvigne et al., 2009). The Ge/Si imprinted into diatom frustules has proven useful for palaeo-reconstructions but it gives no information regarding the sizes of the Si and Ge oceanic pools. The overall Ge/Si for the diatom bSiO2 from the Southern Ocean is relatively constant and appears to reflect seawater Ge/Si (Shemesh et al., 1988; Froelich et al., 1989); however, the late Pleistocene diatom Ge/Si record shows clear, systematic variations between interglacial (Ge/Si = 0.70–0.78 μmol/mol) and glacial periods (Ge/Si = 0.45–0.60 μmol/mol) (Froelich et al., 1989; Mortlock et al., 1991; Bareille et al., 1998) suggesting that size of either the Si or the Ge pool has varied (Murnane et al., 1989; Froelich et al., 1992; Hammond et al., 2000, 2004; King et al., 2000; McManus et al., 2003). To date, little progress has been made to follow up on this earlier work and our understanding on what drives the large variations has little advanced since the work of King et al. (2000), Hammond et al. (2004), and McManus et al. (2003) (see Rouxel and Luais, 2017 for more detail). Zinc is incorporated into diatom bSiO2 in approximately 1–20 ppm levels. Culture studies show that the Zn/Si content of diatom bSiO2 relate to the concentration of free Zn2+ ions in the ambient seawater (Ellwood and Hunter, 1999). However, more recent observations of Zn speciation in the Southern Ocean question this link, because the variability in free Zn2+ ion concentrations are not captured by diatom bSiO2 Zn/Si (Baars and Croot, 2011). Field studies support a link between diatom bSiO2 Zn/Si and productivity and diatom bSiO2 burial rates, although the mechanism behind this relationship is less clear and could relate to nutrient uptake vs. supply, growth rate or salinity (Hendry and Rickaby, 2008; Andersen et al., 2011). The Zn/Si ratio of diatom bSiO2 from sediment cores, which appears to be less susceptible to initial alteration of the bSiO2 as compared to Al/Si (Hendry and Rickaby, 2008), has been used in a small number of studies as a proxy for changes in Zn supply to surface waters in the open ocean and coastal Southern Ocean regions (Ellwood and Hunter, 2000; Hendry and Rickaby, 2008). Recent studies indicate that a large proportion of Zn uptake by diatoms is into the organic material in the cell rather than the bSiO2, challenging its use as a palaeoceanographic proxy (Twining et al., 2003). Thorough cleaning protocols are required to ensure only the Zn incorporated into the silica structure is analyzed (Hendry and Rickaby, 2008; Andersen et al., 2011). Zinc isotopes (denoted by δ66Zn) in diatom bSiO2 ranges from 0.7 to 1.5‰ and appears to relate to changes in seawater δ66Zn composition because of biological drawdown of isotopically light Zn by phytoplankton. If this is the case, then δ66Zn in diatom bSiO2 from sediment cores has the potential to be used as an archive of Zn biogeochemical cycling in the past (Andersen et al., 2011). However, Zn isotopic fractionation during incorporation into diatoms appears to be determined by whether the diatom is utilizing a high or low-affinity Zn transport mechanism, in addition to ambient free Zn2+ concentrations, and is also heavily influenced by surface adsorption and organic matter incorporation (John et al., 2007; Zhao et al., 2014). One study has shown that Zn/Si in sponges relates to the flux of particulate organic carbon (POC) to sediments (Ellwood et al., 2004), leading to its potential use as an export production proxy (Ellwood et al., 2005). Sponge δ66Zn systematics appear to differ between major groups of silicifying sponges: δ66Zn reflects seawater zinc isotopic values in Hexactinellids, whereas Demosponge δ66Zn, most likely reflects a combination of internal isotopic fractionation and fractionation of isotopes in dietary organic matter (Hendry and Andersen, 2013). Given that bSiO2 is high-purity SiO2, the most straightforward targets for geochemical analysis are stable Si and oxygen isotope ratios (denoted by δ30Si and δ18O, respectively). However, other major elements, including C and N that are encased within the bSiO2, have also been analyzed. Here, we review recent developments in the use of major isotope systems in bSiO2 produced by diatoms, sponges and radiolarians as palaeoceanographic proxies. Increasingly, studies of carbon isotopes are turning to the analysis of specific organisms rather than bulk organic matter so that changes in the carbon cycle can be better investigated without the complication of a mixed source. For example, δ13C analysis can be undertaken on the cellular (occluded) organic matter in diatoms, which is well protected from degradation by the frustule. During photosynthesis, organic carbon matter is formed from both HCO3- and CO2(aq) and incorporated into diatoms (Tortell and Morel, 2002). The main control on δ13Cdiatom is the balance between supply and demand for Dissolved Inorganic Carbon (DIC), driven by variations in biological productivity or carbon cellular concentrations. Organisms, including diatoms, preferentially use 12C over 13C, so as photosynthetic demand for DIC rises, increasing amounts of 12C are removed from the DIC pool, leading to progressively higher δ13Cdiatom (Laws et al., 1995). Other factors that could influence δ13Cdiatom include changes in the δ13CDIC of inputs to the water column, particularly in the lacustrine environment where the sources of the carbon supplied will be more variable (Barker et al., 2013), dissolution of diatoms, which releases carbon into the ambient water, and changes in CO2(aq) concentration (Laws et al., 1995; Rau et al., 1996, 1997). Therefore, if factors such as inter-species vital effects can be controlled for (Des Combes et al., 2008), or if samples of a single species are analyzed (Swann and Snelling, 2015), then changes in δ13Cdiatom can be used to reconstruct environmental changes. In marine sediments, this is usually primary productivity (e.g., Shemesh et al., 1995; Panizzo et al., 2014; Swann and Snelling, 2015) and/or changes in CO2 (Heureux and Rickaby, 2015; Stoll et al., 2017). In the case of lake sediments, δ13Cdiatom is used to reconstruct changes in the balance between the source and amount of carbon supply and the productivity within the lake ecosystem (e.g., Barker et al., 2013). The measurement of variations in diatom-bound stable isotopes of nitrogen (expressed as δ15N) is a powerful tool to reconstruct past nitrogen (N) utilization from palaeo-archives (e.g., Sigman et al., 1999; Robinson et al., 2004). To date, ~10 studies have used diatom-bound δ15N obtained from sediment cores to reconstruct palaeo N cycling, with a strong focus on the Southern Ocean (e.g., Crosta and Shemesh, 2002; Robinson et al., 2004, 2005; Robinson and Sigman, 2008; Horn et al., 2011). Shemesh et al. (1993) was the first to develop a method that used the organic matter contained within the hydrated SiO2 matrix of the diatom, making it possible to measure diatom-bound N stable isotopes (15N and 14N). However, during the last decade the chemical preparation has systematically improved (e.g., Sigman et al., 1999; Robinson et al., 2004). During nitrate uptake, diatoms preferentially incorporate the lighter isotope (14N) into the organic matter (e.g., Altabet et al., 1991; Montoya and McCarthy, 1995), which affects the isotope composition of both the diatom and the residual nitrate. An enzymatic pathway catalyzes this process, where nitrate is reduced to nitrite by nitrate reductase (e.g., Needoba et al., 2003), which can lead to high fractionation factors of up to 14.0‰ in cultured polar diatoms (Horn et al., 2011). Generally, the fractionation of diatom-bound δ15N shows a broad range (1–14‰), with high δ15N variations among diatom species (1.9–11.2‰) with weak relationship between δ15N and cellular size and/or surface area (Horn et al., 2011). Unlike bulk sedimentary δ15N, which is routinely measured to reconstruct N cycling (N utilization and N-loss process), preparation of diatom-bound δ15N is more time consuming and cost intensive (Robinson et al., 2012), but does not appear to be isotopically altered by early bacterial diagenesis (e.g., Freudenthal et al., 2001). The oxygen isotope (δ18O) values of calcareous marine microfossils, notably foraminifera, have been used extensively to constrain changes in ocean dynamics (such as global ice volume) over the past 70 Ma of Earth history (e.g., Zachos, 2001; Lisiecki and Raymo, 2005). Antarctic ice volume has likely played a significant role in Cenozoic deep water formation, oceanic circulation, and global-scale climate variations; however, poor preservation of calcareous fossils in high-latitude marine sediments has limited attempts to expand the geographical resolution of the benthic marine carbonate oxygen isotope record (Sarmiento and Toggweiler, 1984; Elderfield and Rickaby, 2000; Lisiecki and Raymo, 2005; Raymo et al., 2006). Unlike carbonate minerals, bSiO2 is generally well preserved in high-latitude marine sediments; therefore, the δ18O values of diatom bSiO2 from these regions have the potential to vastly expand our understanding of coupled ice-ocean dynamics (e.g., DeMaster, 2003; Swann and Leng, 2009). Little is known about spicule δ18O systematics, although there appear to be complex biological vital effects in freshwater sponges (Matteuzzo et al., 2013). A study of a marine carnivorous sponge δ18O showed large fractionation effects and highly heterogeneous isotopic behavior within one individual (Hendry et al., 2015). One downcore study indicates that there are systematic offsets between spicule and diatom bSiO2 δ18O (Snelling et al., 2014). Many (at least 25) glacial-interglacial records, from marine sediment cores, of δ30Si of silicifying organisms (i.e., diatoms, sponges, radiolarians) display a similar trend: lower glacial δ30Si, higher interglacial δ30Si (see Figure 2). While this general pattern has been noted before, most of the records have been interpreted in isolation in terms of nutrient palaeo-utilization (or Si concentrations, for spicule records), and conclusions are related to local-regional nutrient supply (ocean circulation). Trace metal ratios (see section Trace Element Geochemistry of Diatoms and Sponges) may provide an additional constraint but interpretation is difficult since the marine budgets of both the elements (i.e., the trace element, together with the Si cycle) are poorly constrained. Figure 2. Least-squares regression lines fit though sedimentary δ30SibSiO2 records from 25 ka to present, standardized to mean δ30Si of the record: almost all records show an increase from the glacial to the Holocene, with an average trend of ca. 0.045‰ ka-1, suggestive of a common mechanism. Data are from Beucher et al. (2007), Brzezinski et al. (2002), De La Rocha et al. (1998), Doering et al. (2016), Ehlert et al. (2013), Ellwood et al. (2010), Hendry et al. (2010), Hendry et al. (2014), Hendry et al. (2012), Horn et al. (2011), Kim et al. (2017), Maier et al. (2013), Panizzo et al. (2014), Pichevin et al. (2012), Pichevin et al. (2009), Sutton (2011), and Xiong et al. (2015). Silicon isotope ratios in diatom bSiO2 have been used widely as a proxy for marine DSi utilization in surface waters due to the preferential fractionation of the lighter isotope of Si during diatom silicification (see section Marine for more detail). The proxy works on the premise that as diatoms grow in a “parcel” of seawater and progressively use up the available DSi, both the remaining DSi and the bSiO2 produced at any instant become progressively isotopically heavier (see section Marine for detail). The fractionation can be modeled, assuming either closed or open distillation of Si isotopes, allowing the back-calculation of past utilization from downcore diatom δ30Si archives (De La Rocha et al., 1997, 1998; Varela et al., 2004). The calculation assumes a known and constant fractionation factor, denoted by epsilon (see section Stable Silicon Isotope Ratios to Study the Global Si Cycle). Similar to marine work (Varela et al., 2004; Closset et al., 2015), lake sediment traps have shown the δ30Si signature of diatoms (δ30Sidiatom) to be resilient to dissolution and preserved through the water column into the sediment record (Panizzo et al., 2016). Accordingly, δ30Sidiatom from lacustrine sediment cores can be used to reconstruct past changes in biogeochemical cycling at the catchment/drainage basin scale. Whilst only a limited number of palaeolimnological studies have been undertaken, all demonstrate the potential for δ30Sidiatom to constrain long-term changes in the Si cycling in relation to catchment processes and/or physical limnological. For example, a record from Arctic Siberia covering the last 31 ka demonstrates that rates of DSi utilization are governed by catchment weathering and ice-cover duration together and mixing in the water column (Swann et al., 2010). Elsewhere, records from East Africa demonstrate the importance of monsoonal rainfall and their associated impact on vegetation in regulating the Si cycle. In the upper White Nile basin results reveal that higher monsoonal rainfall and associated increases in forest cover and chemical weathering increased the flux of DSi from land to rivers during the late-glacial/mid-Holocene, conditions that reversed after 5.5 ka with the emergence of dryer conditions and open vegetation/crops (Cockerton et al., 2015). Further east in Kenya measurements of δ30Sidiatom in a lake demonstrate that high levels of glacial diatom productivity were supported by increased fluxes of Si from the sparse catchment (Street-Perrott et al., 2008). Subsequent reductions in aquatic productivity then coincide with the development of grasslands and other Holocene vegetation, in response to increase monsoonal rainfall, which reduced Si transportation to the lake (Street-Perrott et al., 2008). The potential of δ30Si is particularly evident in regions where climate change and anthropogenic lake catchment alteration (e.g., nutrient loading) are prompting limnological responses (e.g., increased duration of lake stratification and warmer surface water temperatures), which impact within lake biogeochemical cycling (Panizzo et al., 2017). For example, the approach has been demonstrated as a means to identify biogeochemical responses to climate change (Street-Perrott et al., 2008; Swann et al., 2010) and its value over more recent timescales is also stressed here as a means to address current pressures. Comprehensive contemporary limnological monitoring is also emphasized (Opfergelt et al., 2011) to enable quantitative estimations of seasonal DSi and bSiO2 cycling (via open or closed system modeling), by providing key constraints on deep-surface water δ30SiDSi exchange, Si residency times and Si uptake (Panizzo et al., 2016, 2017). These data also serve to validate conventional palaeolimnological approaches, which can be applied to constrain continental bSiO2 export from lake and reservoirs, particularly under a projected future of enhanced anthropogenic and climatic pressures on these systems. Unlike diatoms, there is evidence that siliceous sponges have a variable fractionation of Si isotopes with respect to seawater. A compilation of modern sponge spicules, and core top spicules, reveals that there is a statistically significant non-linear relationship between sponge δ30Si, or the difference between seawater and spicule δ30Si (denoted by Δ30Si), and ambient DSi concentrations during sponge growth (Hendry et al., 2010; Wille et al., 2010; Hendry and Robinson, 2012). This empirical calibration means that there is a great potential for spicule δ30Si in sediment cores to be used as a proxy for bottom water DSi concentrations in the past, providing key information about the supply of waters that feed diatom productivity (Hendry et al., 2010; Hendry and Robinson, 2012). The relationship is robust between laboratories (Hendry et al., 2011), and whilst the mechanism behind this relationship remains unclear, the observations are consistent with a strong growth-rate dependence on DSi uptake in sponges (Wille et al., 2010; Hendry and Robinson, 2012). The relationship between DSi and sponge δ30Si appears to hold for different filter-feeding sponges from different taxonomic groupings and ocean basins, growing in significantly different temperature, salinity and pH conditions (Hendry and Robinson, 2012). Furthermore, spicules from core top sediments also fall on the same calibration line, indicating minimal impact of early diagenetic processes (Hendry and Robinson, 2012). However, unusual biomineralization processes and potentially the internalization and isolation of the aquiferous system in highly-derived carnivorous sponges result in δ30Si values that deviate significantly from the global compilation (Hendry et al., 2015). Further investigation into different biomineralization pathways—and their impacts on isotopic fractionation—would be beneficial. Studies of isotopic fractionation by sponges grown in culture will add a great deal to our understanding of spicule geochemistry and biomineralization mechanisms. There have been fewer studies into the stable isotope composition of radiolarians compared to diatoms and sponges, and their use as palaeoceanographic archives is very much in its infancy. Radiolarian Si and oxygen isotope fractionation factors are challenging to constrain from culture studies because they are difficult to grow under laboratory conditions and field studies are limited by knowledge regarding the migration, strong biogeographic distributions and relatively sparse numbers (Suzuki and Aita, 2011). However, there have been a small number of studies that have attempted to constrain a fractionation factor for Si isotopes in radiolarians, which have estimated a similar fractionation range as for modern diatoms (ca. −0.5 to −2.1‰; Hendry et al., 2014; Abelmann et al., 2015). As such, there is potential for radiolarian δ30Si to be used, in combination with modeling efforts, to constrain mid-depth to surface DSi systematics. In short, more sediment records of δ30Si in sponges and radiolarians are needed to estimate nutrient concentrations and distribution with reorganizations in ocean circulation. The Southern Ocean plays a key role in climate variability, via heat transport and atmospheric greenhouse gas changes, over glacial-interglacial timescales through both physical and biogeochemical mechanisms. One such mechanism to explain at least part of the atmospheric CO2 changes observed in ice core records is the Silicic Acid Leakage Hypothesis SALH (Brzezinski et al., 2002; Matsumoto et al., 2002). The SALH proposes that enhanced dust deposition in the Southern Ocean during glacial periods causes physiological changes in diatoms, such that they take up less DSi relative to other nutrients (i.e., N, P), resulting in the export of DSi enriched waters via AAIW (Ellwood et al., 2010; Rousseau et al., 2016). Supply of relatively DSi-rich Mode Waters at lower latitude would enhance the growth of diatoms over carbonate producers, altering ocean alkalinity leading to a reduction in atmospheric CO2 (Matsumoto and Sarmiento, 2008). Geochemical archives locked up in bSiO2 can be used to test the SALH. A recent example, used both oxygen and Si isotopes in diatoms and radiolarians, from glacial-aged sediments from the Southern Ocean, to provide reconstructions of seasonal nutrient cycling. Data show strong variability in the mixed layer depth in the seasonal sea-ice zone, which allowed for sufficient nutrient exchange between surface and deeper waters, thereby fueling carbon drawdown in an otherwise highly stratified glacial Southern Ocean (Abelmann et al., 2015). Diatom δ30Si and organic-bound δ15N archives from the Southern Ocean have also been coupled with a spicule δ30Si record of bottom water DSi concentrations to investigate DSi utilization across the last glacial termination. By modeling the diatom Si-uptake, assuming the spicules reflect the supply of DSi, these archives demonstrate periods of intense upwelling and a greater utilization of the DSi supply in response to changes in iron availability during the deglaciation period (Horn et al., 2011). In addition to using the relative bSiO2 accumulation rates between the Southern Ocean and lower latitudes as a test for Si export (e.g., Bradtmiller et al., 2009; Meckler et al., 2013), it is possible to use combined geochemical proxy records to test the SALH (Rousseau et al., 2016). Biogenic SiO2 archives point toward abrupt shifts in productivity and DSi utilization at glacial terminations, rather than changes on glacial-interglacial timescales (e.g., using coupled spicule, hand-picked radiolarian and diatoms from archives in the Sargasso Sea; Hendry and Brzezinski, 2014). Such observations, and other geochemical records, have led to the formulation of a new Silicic Acid Ventilation Hypothesis, which posits that sluggish glacial Southern Ocean overturning primed southern sourced Mode Waters to cause major changes in nutrient distribution during periods of abrupt climate change in low latitude regions influenced by intense ventilation (Hendry and Brzezinski, 2014; Hendry et al., 2016). The cleaning of bSiO2 remains an important challenge in δ30SibSiO2, δ18ObSiO2, δ13Cdiatom, and δ15Ndiatom reconstructions. Contamination, via the presence of residual tephras or clays can compromise the precision of reconstructions, with the introduction of significant isotopic offsets (Morley et al., 2005; Lamb et al., 2007; Brewer et al., 2008). This is often more pronounced for diatoms (and radiolarians; Abelmann et al., 2015) due to the ability for contaminant valve adherence and occlusion, over sponge spicules that can be picked. Clay δ30Si compositions are estimated between −2.95‰ and +2.5 (Douthitt, 1982; Georg et al., 2009; Opfergelt and Delmelle, 2012), which can significantly lower reported δ30Sidiatom values [published values range between −0.07 and +3.05‰; (De La Rocha et al., 2000; Cardinal et al., 2007; Sun et al., 2013; Panizzo et al., 2014, 2016)] and outside of analytical uncertainty, while high sample presence of different phases of bSiO2 can have a similar effect (e.g., δ30Sisponge signatures vary between −5.72 and +0.87‰ Douthitt, 1982; De La Rocha, 2003; Wille et al., 2010; Hendry and Robinson, 2012). As a result, purity is routinely demonstrated visually (via scanning electron microscopy) and via quantitative assessments of sample geochemistry (e.g., Al2O3) (Brewer et al., 2008; Chapligin et al., 2012). These serve, in the first instance, to demonstrate the efficiency of cleaning (SiO2:Al2O3 >1) and robustness of reconstructions. When not possible, these data permit contamination mass-balance calculations and a compositional offset correction of reported data (Brewer et al., 2008; Mackay et al., 2011, 2013; Wilson et al., 2014). There have been a number of methodological advancements following the earliest published bSiO2 cleaning protocols (Labeyrie and Juillet, 1982; Shemesh et al., 1988, 1995; Morley et al., 2004), which demonstrate that in order to address the challenges in bSiO2 cleaning, methods should be tailored depending on the characteristics of individual samples and frequent visual inspection should be carried out throughout. Application of the δ30Si proxy for DSi utilization, assumes a constant fractionation factor (see section Stable Silicon Isotope Ratios to Study the Global Si Cycle). This has been challenged with evidence of species-dependent δ30Si fractionation variability between DSi and bSiO2 phases (Sutton et al., 2013). The work of Sutton et al. (2013) suggests that interpretation of marine sediment-based reconstructions, should include an evaluation of species composition for more accurate interpretations of δ30Si downcore variability. While these data shed light on potential species effects, each diatom strain in the Sutton et al. (2013) study was grown under its specific optimal environmental conditions in order to minimize the influence of external environmental factors (e.g., irradiance and/or temperature). The influence of environment on δ30Si composition in diatoms has yet to be shown under laboratory controlled conditions. Data from in-situ/natural settings, have not documented a species effect (e.g., Cardinal et al., 2007; Fripiat et al., 2012; Closset et al., 2015) although if anything this clearly demonstrates the need to better understand the variability of δ30Si in diatoms. Similarly, it is essential to take any different ecological preferences of the diatoms present in the sediment core into consideration. There may be significant differences in when and where particular dominant species are growing, or if there is a pronounced preservation bias toward more heavily silicified species. For example, late season diatoms may bloom in already modified surface waters and large, deep-dwelling diatoms may opportunistically utilize DSi supplies that are hundreds of meters deep that has a different δ30SiDSi compared to near surface waters (Hendry and Brzezinski, 2014; Xiong et al., 2015). Another example is in Sea-Ice Zone of the Southern Ocean, where diatoms living within the sea-ice bear heavier δ30Si than diatoms in the surrounding waters due to a closed system where silicic acid can be limited (Fripiat et al., 2007; Panizzo et al., 2014). Despite an extensive effort by many researchers over the past five decades (e.g., Mopper and Garlick, 1971; Labeyrie, 1979; Labeyrie and Juillet, 1982; Chung-Ho and Hsueh-Wen, 1985; Leclerc and Labeyrie, 1987; Matheney and Knauth, 1989; Shemesh et al., 1992; Swann and Leng, 2009; Pike et al., 2013; Crespin et al., 2014; Abelmann et al., 2015), uncertainty associated with the bSiO2-water oxygen isotope fractionation has limited the application of bSiO2 δ18O values as a palaeoceanographic proxy. The disparate bSiO2-water fractionation factors have been attributed to two primary causes: (1) methodological biased and/or incomplete removal of hydroxyl oxygen, and (2) potential alteration of δ18O values during bSiO2 formation/diagenetic alteration of δ18O values on geologic timescales. The analytical bias has been addressed thorough an inter-laboratory comparison that showed no significant difference in δ18O values across a range of dehydration and analytical techniques (Chapligin et al., 2011); therefore, the only remaining source of uncertainty is in the bSiO2-water fractionation relationship recorded by the diatom bSiO2. Diatoms from laboratory cultures and marine sediment traps seem to have a reproducible bSiO2-water fractionation relationship (Matheney and Knauth, 1989; Brandriss et al., 1998; Schmidt et al., 2001; Dodd et al., 2017) that is different from the bSiO2-water fractionation relationship recorded by sedimentary diatoms and quartz-water equilibrium (e.g., Leclerc and Labeyrie, 1987; Matheney and Knauth, 1989; Schmidt et al., 2001). Even within sedimentary marine diatom bSiO2 archives, there does not appear to be a single bSiO2-water fractionation relationship. Leclerc and Labeyrie (1987) published a bSiO2-water fractionation for marine diatoms from core-top sediments and surface waters (δ18Owater and T); however, within their dataset, δ18O values of diatom bSiO2 from high-latitude cores overestimated surface water temperatures by several °C. Shemesh et al. (1992) proposed the high-latitude diatoms represented a fundamentally different bSiO2-water fractionation factor; however, a recent re-examination of bSiO2-water fractionation factors over the entire range of formation temperatures (0–850°C) suggest that marine diatoms may record the same bSiO2-water fractionation relationship has high-temperature opal/quartz (Sharp et al., 2016). A uniform bSiO2-water fractionation factor implies that living diatoms most likely precipitate bSiO2 out of isotopic equilibrium (e.g., Brandriss et al., 1998; Dodd et al., 2017); however, sedimentary (aka mature) diatom bSiO2 most likely approaches quartz-water equilibrium (Sharp et al., 2016). It is, therefore, likely that the δ18O values of diatom bSiO2 record a combination of diagenetic (e.g., sedimentary pore water) conditions. Further work is needed to establish the timing, degree, and mechanism of diagenetic changes to diatom δ18O values; however, experimental studies suggest a combination of dehydroxylation and precipitation of abiogenic SiO2 (e.g., Dodd et al., 2017). 1. Continue to produce high quality data (e.g., sample preparation, chemical procedure, mass spectrometric analysis, data analysis, the development of robust models, and the need for more data-model comparisons). 2. Use multiple bio-geochemical tools simultaneously, i.e., a single isotope system is not perfect and should be coupled with other bio-geochemical proxies (e.g., Ge/Si) and parameters (e.g., salinity, temperature). 3. Better understand what controls the fractionation factors of the various bio-geochemical tools used to study the role of siliceous organisms (e.g., sponges, diatoms, radiolaria, picophytoplankton) and globally important processes (e.g., reverse weathering, dissolution) on the global fluxes of Si. 4. Provide information on complex (though key) systems, e.g., estuaries and coastal environments, continental seas (e.g., the Arctic Ocean), sediment diagenesis (anoxic vs. bio-active), hydrothermal activity, soil systems, and particle–water interactions. The global Si cycle starts with the chemical weathering of silicate minerals, is transformed and re-distributed into lakes, rivers, terrestrial and freshwater organisms, soils, aerosols, seawater marine organisms, and sediment, and eventually becomes a mineral once again. During these various transformations, Si interacts with numerous other major (e.g., C, N) and minor (e.g., Al, Ge, Zn) elements and, in turn, influences their biogeochemical cycles. Investigation of the movement, transformation, and fractionation of the stable isotopes and associated elements involved in the bio-geochemical cycling of Si provides knowledge not only to help constrain the distribution and behavior of the global Si fluxes and their potential variability over time, but also provides knowledge on the mechanisms of Si biomineralization. This information is essential for understanding the short- and long-term variation in the range of these data, which are used to evaluate the utility of these bio-geochemical tools for palaeoceanographic interpretation. JS and KH conceived of the project. JS drafted the manuscript with substantial contributions to the work by all authors. The manuscript was edited and approved by all authors. The work by JS was supported by the “Laboratoire d'Excellence” LabexMER (ANR-10-LABX-19) and co-funded by a grant from the French government under the program “Investissements d'Avenir,” and by a grant from the Regional Council of Brittany (SAD programme). DJC was partially supported by the Knut and Alice Wallenberg Foundation (KAW Wallenberg Scholar) and the Swedish Research Council. This review article has benefited from funding by the European Union Seventh Framework Programme under grant agreement n°294146 (project MuSiCC, Marie Curie CIG to DC). GdS is supported by a Marie Skłodowska-Curie Research Fellowship under EU Horizon2020 (GA #708407). JuD was supported by the American Chemical Society Petroleum Research Fund (Grant # 53798-DNI2). CE acknowledges financial support by the Institute for Chemistry and Biology of the Marine Environment (Oldenburg, Germany) and the Max Planck Institute for Marine Microbiology (Bremen, Germany). KH is funded by The Royal Society (UF120084) and the European Research Council (ERC-2015-StG - 678371_ICY-LAB). PG acknowledges funding by the Collaborative Research Centre 754 “Climate-Biogeochemistry interactions in the Tropical Ocean” (www.sfb754.de), supported by the Deutsche Forschungsgemeinschaft (DFG). The handling editor declared a shared affiliation, though no other collaboration, with one of the authors, JS. We thank the organizers of Silicamics and the Silica Group (UMR 6539 CNRS/UBO/IRD/Ifremer, LEMAR - IUEM - 29280 - Plouzané, France) for providing the initiative to write this review. We also thank J. Martinez, of GraphicProtype, for his conceptual and illustrative help with the main figure (Figure 1). Aller, R. C. (2014). “Sedimentary diagenesis, depositional environments, and benthic fluxes,” in Treatise on Geochemistry, Second Edition, Vol. 8, eds H. D. Holland and K. K. Turekian (Oxford: Elsevier), 293–334. Baines, S. B., Twining, B. S., Brzezinski, M. A., Nelson, D. M., and Fisher, N. S. (2010). Causes and biogeochemical implications of regional differences in silicification of marine diatoms. Glob. Biogeochem. Cyc. 24:GB4031. Bareille, G., Labracherie, M., Mortlock, R. A., Maier-Reimer, E., and Froelich, P. N. (1998). A test of (Ge/Si)(opal) as a paleorecorder of (Ge/Si)(seawater). Geology 26, 179–182. Brandriss, M. E., O'Neil, J. R., Edlund, M. B., and Stoermer, E. F. (1998). Oxygen isotope fractionation between diatomaceous silica and water. Geochim. Cosmochim. Acta 62, 1119–1125. Brümmer, F. (2003). “Living inside a glass box – silica in diatoms,” in Progress in Molecular and Subcellular Biology, ed W. E. G. Müller (Berlin; Heidelberg: Springer-Verlag), 3–9. Criss, R. E. (1999). Principles of Stable Isotope Distribution. New York, NY: rd University Press. Garcia, H. E., Locarnini, R. A., Boyer, T. P., Antonov, J. I., Baranova, O. K., Zweng, M. M., et al. (2014). “World Ocean Atlas 2013, Volume 4: dissolved inorganic nutrients (phosphate, nitrate, silicate),” in NOAA Atlas NESDIS, ed S. Levitus (Silver Spring, MD: NOAA-NESDIS), 25. Hoefs, J. (2009). Stable Isotope Geochemistry. Berlin; Heidelberg: Springer. Iler, R. K. (1979). The Chemistry of Silica: Solubility, Polymerization, Colloid and Surface Properties, and Biochemistry. New York, NY: Wiley. Labeyrie, L. D. (1979). La composition isotopique de l‘oxygène de la silica des valves de diatomées. Mise au point d'une nouvelle méthode de paléoclimatologie quantitative. Thesis, Université de Paris. Ma, J. F., Miyake, Y., and Takahashi, E. (2001). “Silicon as a beneficial element for crop plants,” in Silicon in Agriculture, eds L. E. Datnoff, G. H. Snyder, and G. H. Korndorfer (Amsterdam: Elsevier), 17–39. Mann, S., and Perry, C. C. (1986). “Structural aspects of biogenic silica,” in Silicon Biochemistry, CIBA Foundation Symposium 121, eds D. Evered and M. O'Connor (New York, NY: Wiley), 40–58. Perry, C. C., Belton, D., and Shafran, K. (2003). “Studies of biosilicas; structural aspects, chemicalprinciples, model studies and the future,” in Silicon Biomineralization: Biology—Biochemistry—Molecular Biology—Biotechnology, ed W. E. G. Müller (Berlin; Heidelberg: Springer), 269–299. Sutton, J. (2011). Germanium/Silicon and Silicon Isotope Fractionation by Marine Diatoms and Sponges and Utility as Tracers of Silicic Acid Utilization. Thesis, Australian National University. Takahashi, E., Ma, J. F., and Miyake, Y. (1990). The possibility of silicon as an essential element for higher plants. Comments Agric. Food Chem 2, 99–122. Wollast, R., and Mackenzie, F. T. (1989). “Global Biogeochemical Cycles and Climate,” in Climate and Geo-Sciences: A Challenge for Science and Society in the 21st Century, eds A. Berger, S. Schneider, and J. C. Duplessy (Dordrecht: Springer), 453–473. Copyright © 2018 Sutton, André, Cardinal, Conley, de Souza, Dean, Dodd, Ehlert, Ellwood, Frings, Grasse, Hendry, Leng, Michalopoulos, Panizzo and Swann. This is an open-access article distributed under the terms of the Creative Commons Attribution License (CC BY). The use, distribution or reproduction in other forums is permitted, provided the original author(s) and the copyright owner are credited and that the original publication in this journal is cited, in accordance with accepted academic practice. No use, distribution or reproduction is permitted which does not comply with these terms.